Maybe I've just seen too many rubbish ancient world films, especially those based on mythology, but I thought this was really pretty good - I was pleasantly surprised. It was funny, the cast of British thespians did their thing well, The Rock was fine (I've quite enjoyed all the acting performances of his that I've seen, which is mainly The Mummy Returns and Star Trek: Voyager's 'Tsunkatse'), and most importantly it played around with ancient mythology in some interesting ways, putting some nice twists on the material. For once, I've kept spoilers to a minimum in this review, because the film rests on a couple of turns and revelations that you should see for yourself if you're at all interested in this sort of film. I also won't go through the many ways in which the film differs from the various ancient sources, which would not only be tedious, but would miss the point entirely. The whole reason for telling new versions of ancient stories is to put a new spin on the material, which is what the ancient versions certainly do - you'd struggle to find any two or three versions of Hercules' story that are particularly similar. (I will mention briefly that the mythical Eurystheus is king of Mycenae, not Athens - evidently the writers thought the audience were more likely to have heard of Athens, or perhaps they just wanted to redress the balance a bit re screen interpretations of the city. We also get the ever-irritating assumption that 'Elysium' equates to heaven and 'Hades' to hell - heaven and hell are medieval Christian concepts). I will say that the film used or referenced lots of aspects of Hercules' mythology, many of which often get left out of modern interpretations. It mentioned the derivation of his name (they went for 'glory of Hera' whereas I would usually translate it as 'glory through Hera', and it would have helped if they'd used the Greek 'Herakles' instead of the Latin 'Hercules', but still), as well as the various Labours, the snakes he supposedly strangled in his cradle, even the murder of his first wife Meg(ara) and their children, and he wore the skin of the Nemean Lion when fighting, which I loved (a reason is provided in story for such an impractical bit of kit, as well). It was lovely to see so many bits and piece of Hercules' mythology get a shout-out. 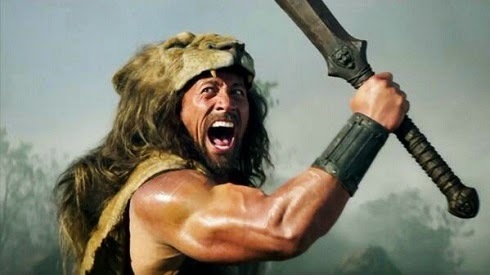 Considering how much of the ancient Hercules was put into the film, I have to confess I was a bit disappointed when the young man loudly singing Hercules' praises at the beginning turned out to be Iolaus, rather than Hylas, so there was no reference to the complexities of ancient sexuality. Iolaus in mythology is Hercules' nephew and much of Hercules' mythology revolves around his relationships with his two wives and his children, so the portrayal of uncle and nephew here would be perfectly recognisable to the Greeks - but the emphasis put on the blood relationship in Iolaus' early scenes and the lack of subtlety with which the point is made that Iolaus likes girls suggests the makers must be aware that some viewers might assume a different relationship between an older ancient Greek warrior and a younger man. How fantastic would it have been if this part went to Hylas, Hercules' younger lover, instead? Ah well, maybe some day. Alongside the mythology, there was an interesting nod to historical developments as well. The warfare described in Homeric epic is all about individuals fighting alone and gaining glory, but sometime during the Archaic period, hoplite warfare was developed, which relied on soldiers creating a wall of shields, each half protecting himself, half the man next to him, and basically shoving the enemy as hard as possible (300 depicts this for about 30 seconds before it gets bored and everyone starts leaping about like a mad thing). The Chigi Vase, which depicts hoplite warfare - it's all about shoving the enemy. The film sort of seems to be trying to depict this change. 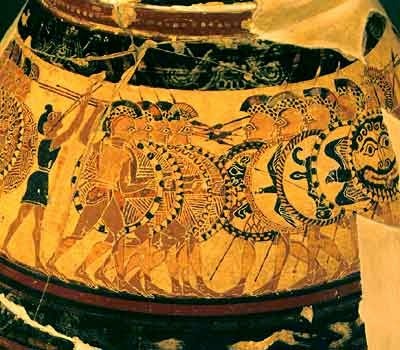 Our heroes themselves fight individually and make use of chariots, like in the epics (these chariots are far too big to be Mycenaean war chariots - though they might fit Homer's somewhat inaccurate description of Mycenaean war chariots). However, Hercules teaches the army something like the hoplite style, focusing on maintaining a wall of shields - except he leaves out the bit about creating deep lines of hoplites, to help with the pushing. The shields the army are using are presumably supposed to reflect Ajax's tower shield from the Iliad, a style also seen on a Mycenaean ring from Mycenae, but most pre-hoplite Greek soldiers would have had smaller, round shields. Then Iolaus equips the men with hoplite armour, but only half of them - which would completely defeat the object, as they all have to have the same shields for the thing to work. All in all, it's a rather nice attempt to tie the story in to historical developments and a particular historical period, but there are some noticeable holes in the depiction of the fighting. (Edited to add: apparently the film is set in 358 BC - see comments - in which case this is all ridiculous, because it was all happening in the Archaic Age. Phillip II of Macedon made some changes to Macedonian phalanxes, e.g. giving them longer spears, around the fourth century BC, but hoplite warfare had been around for centuries). My favourite thing about this film was that, like the BBC's Atlantis, it played around with the legend of Hercules and with the idea of storytelling. Ignore the incredibly misleading trailer (which also gives away the movie's best moment) because this is barely a fantasy film. It has prophecy in it, as do many ancient world stories, fantasy or otherwise (including I, Claudius and The Roman Mysteries) and the extent of Hercules' strength beggars belief, but otherwise this is a film in which the Hydra is a group of criminals wearing snake-like disguises and centaurs are just cavalry (rare in the mountainous landscape of Greece). In fact, the whole resolution of the plot, which I won't give away here, rests on the legend of Hercules, on how his story has grown and spread, regardless of the reality. It's an excellent theme for a version of a Greek myth, reflecting the importance of heroic kleos (glory) that gives Herakles his name. I enjoyed this film a lot more than I expected to. I really liked Ian McShane's Amphiaraus, who's almost like a slightly chirpier version of The X-Files' Clyde Bruckman, and it was nice to see Atalanta in there (even if she's magically become an Amazon to save time on explaining her backstory). It's not a cinematic masterpiece or anything, but I found this an enjoyable and interesting addition to Hercules' mythology. Xena: Warrior Princess does the It's a Wonderful Life thing. It's quite early in the show to be doing that, but then, Xena has a particularly dramatic backstory and a pre-existing history in Hercules: The Legendary Journeys, so it works. While paying her respects to her late brother, Xena protects a temple of the Fates, so they offer her a reward. Xena says all she wants is for the young boy she just killed (he was attacking her) to be alive, and she wishes she'd never 'followed the sword'. So the Fates change history, with the knock-on effect that her brother never died, but warn her that as soon as she spills a drop of blood in anger, everything will snap back into place. The Fates here are represented as three woman spinning a thread, which is not far off the ancient Greek Fates. The Greek Fates were the Spinner, who spun the thread of life, the Apportioner of Lots, who measured it, and the one who cannot be turned, who cut it, rather than the maiden, mother and crone seen here (whether or not the maiden/mother/crone division goes back to ancient religion is debatable, but it has more to do with Robert Graves than anything else). The maiden/mother/crone thing works well enough, though, and I liked the simple visualisation of it using three actresses at various ages. Xena's brother Lyceus at one point mentions that his virillus token, which Xena teases him for still wearing, once saved his life. This is presumably inspired by the ancient Roman bulla amulets freeborn children wore (girls and boys), which they took off when they came of age (i.e. got married for girls, or put on a toga for boys). The word 'virillus' is derived from the Latin for 'manly' ('vir' means 'man') so this seems to be the Xenaverse equivalent, though the name is a bit the wrong way around assuming you become a man when you take it off - it may be intended as a diminutive (like 'Drusilla', feminine diminutive form of 'Drusus') in which case the grammar's a bit off, but you can see what they were going for. It's a nice touch, throwing in a genuinely ancient custom that also serves the story by emphasising how young the boy Xena kills in the opening sequence is. Xena is informed what will happen if she spills blood at the beginning of the episode and ends it by doing so anyway, but interestingly this is not an example of the classic trope in Greek mythology of people being given a clear instruction they utterly fail to follow for no particular reason (see: Orpheus, Odysseus' crew). The way the Fates initially give the instruction, saying "until you spill a drop of blood in anger", clearly indicates that they do not really expect Xena to be able to follow it, and they turn up a few times throughout the episode, almost seeming to want to persuade her to return to her old life. In the end, Xena makes a conscious choice to spill blood and reset the world. I thought it was rather a shame that ultimately she did so to preserve Gabrielle's innocence and protect her from experiencing what it is to kill another person, since their lifestyle surely suggests Gabrielle will inevitably end up killing someone at some point in self-defence, and to sacrifice her brother for that specific reason doesn't seem quite right. Still, overall she was able to make some peace with herself when he encouraged her to stand with him and told her not to fight destiny. The Fates' real gift to Xena is that she feels better about her life and her choices, despite the high price she's had to pay - and they give her a little extra time to save the boy from the opening as well, so at least one life is spared in the end (and her mother's, of course - though I suspect most mothers would willingly exchange their life for their son's, which is why, although saddened, Xena doesn't change things back straight away on finding out her mother died). In really liked this episode - I love It's a Wonderful Life episodes anyway and this one was really well done. Lucy Lawless' performance is great, giving Xena a softer edge (while Gabrielle's is much harder) and investing all of it, especially the scene at her mother's tomb, with real emotion. I also enjoyed seeing Xena use her brains as well as brawn and try to find increasingly inventive ways to fight people without spilling any blood (though I have to say, if you set someone on fire, you will spill their blood). I was a bit puzzled by the section in which our heroes are suspended in very high cages, as if being saved for dinner by the giant from 'Jack and the Beanstalk', and Xena's brother becomes the latest victim of the 'everyone Gabrielle fancies dies' curse, but overall it was a very satisfying installment. Even the opening shots of New Zealand were gorgeous, as long as you ignore the fact they're obviously re-used footage from season one (Gabrielle is in her early season one costume). Definitely a good use of the old trope. Gabrielle: I don't know whether to thank you or to hate you. Disclaimer: Xena's memory was not damaged or... ...what was I saying?